Lucas Argrew in his shop in Wilton. WILTON - One year into their move from Auburn into downtown Wilton, Beyond Shoe Repair is continuing to expand its number of products, staff and drop off locations. 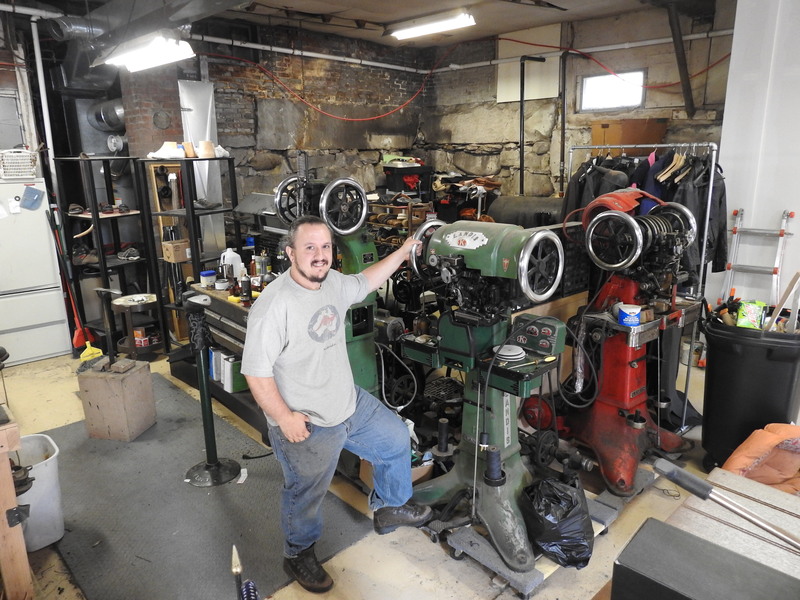 One of seven or eight shoe repair shops in the state, Beyond Shoe Repair was started in 2014 by Lucas Argrew in Auburn. Last year, the shop moved to 514 Main Street in Wilton. Argrew, who took up cobbling while living in Ohio and moved back east after the recession hit, said that the community has been very welcoming. "We really appreciate the reception," Argrew said. "We're really just trying to keep this industry alive for people who want it and need it." There are only a handful of cobblers across the state, Argrew said, and he's the only one that's younger than 50. As the industry is reliant upon new blood, Argrew has taken on an apprentice, Isaiah Alexander, as the business continues to grow. Beyond Shoe Repair also works on snowshoes, luggage, equestrian gear and other restoration or repair jobs that involve heavy sewing through leather or rubber. Locally, they've worked with police departments on holsters, microphone straps and other equipment, as well as school districts on instrument cases. Their specialty, however, remains shoes, ranging from simple repairs to specialized orthopedic work. "Anything that goes on your feet," Argrew said. The repair shop offers discounts to repair shoes made in Maine, such as old Bass or Rancourts. They've also opened an Etsy e-commerce shop for small leather items like belts, wallets and coin purses. Future ideas include crafting costumes and props. The hours of the Wilton shop are Wednesday through Friday, 9 a.m. to 5 p.m., and Saturday from 10 a.m. to 3 p.m. Beyond Shoe Repair also has drop off locations for shoes in Bath and Brunswick, inside J & J Dry Cleaners establishments; in Auburn in the Going Postal store; and at the store in Wilton. Argrew is also looking at opening a drop off location in Norway. Beyond Shoe Repair is also available via appointment by calling 645-2262. For the Beyond Shoe Repair website click here, and for Facebook click here. Kudos to Lucas! He has repaired several items for me. Workmanship and service is superior, and turnaround time has been quick. I highly recommend him. I have been very happy with the quality of work. Plus I am VERY happy to support this business and not to buy new shoes. Thank you Lucas! 4 pairs of shoes and counting! As a repeat customer, I can attest to the quality of Lucas' work and the customer service he provides. Highly, highly recommended. I did not know this place existed! Thank you Bulldog for this story! I will make sure my Dad knows about it, as he has a problem with shoes! I also have a suitcase I might bring in to see if it can be sewn! I'm taking over a dog crate for a zipper renewing. Hope he can help me. Thanks for the article, I thought he just did shoes. Go Lucas and crew! SO glad to have this business in town. Did a great job on my boots and new straps for my snowshoes. Great guy and a great business to have in Wilton! Keep up the good work Lucas! Way to go. Hey, Can I get a job there, working very part time. Maybe teaching new stitchers? I used to do cripples in the stitching room at Bass. Oh so many years ago. Lots of people would rather have shoes repaired than break in new ones. Way to go.